Today's cartoon will be controversial. Let me hasten to tell you that I am just as much a bleeding heart as the next person; I love clean air, respect the earth, and cry for those baby seals just as much as anyone else. But what I hate more than most things is when people, some daring to call themselves scientists, manipulate our emotions for their own personal agenda. So today I've given them a bit of their own medicine. They may be well-intentioned, these "scientists," politicians and NGO'ers who have stepped beyond the bounds of their own methodology to twist our collective gut; but they have forgotten the scientist's Hippocratic Oath, which is first to open their research, their methods and their calculations for all to see, share and contest; and second to remain humble before the enormity of their task, refusing to take themselves too seriously and pretend to be what they're not. We don't need dragon-slayers; we need sober, wise, precautious scientists. 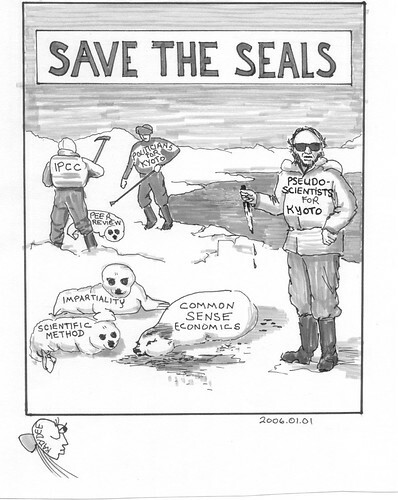 Climatology, even more than economics, is a relatively new science. Data is recent. This is to say it covers only an iota of time on the grand scale. To draw any conclusions and make any predictions, catastrophic or otherwise, is premature at best and pure folly from a scientific point of view. See here for someone else's opinion. Why do we have to go to Germany to read this kind of mediatic common sense? Is the rest of the world including America so sensationalized that no reasoned voice can make it through the cacophonic hysteria? PBS, National Geographic, Science Magazine, and others of your ilk: beware. You are being watched --perhaps even tried and executed. You will be your own undoing, because you are traiters to your cause, murderers of your own "raison d'etre."